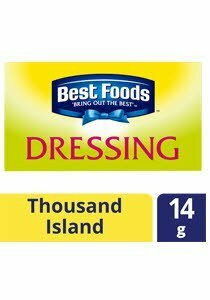 The flavourful Best Foods Thousand Island Dressing is tangy and combines the best ingredients of real tomato paste and chunky gherkin relish that are ideal as a dressing for your salad greens and as a dipping sauce. Soybean Oil, Sugar, Vinegar, Gherkin Relish, Egg, Chilli Sauce, Tomato Paste, Modified Starch, Mustard, Salt, Spices, Edible Gum, Preservative (E202), Calcium Disodium EDTA. Made with real tomato and chunky gherkin relish, just like the traditional recipe. Made by a brand established since 1905 and is today’s No.1 Mayonnaise Brand in the USA.